Meanwhile, I’m back home and still have to report the latest events of the recent journey. On Friday – our last day in Chernivtsi (Czernowitz) – Arthur and I have been on a day trip through Bukovina and Galicia with the volunteers of SVIT Ukraine. Vashkivtsi, Vyzhnytsia (Wischnitz), Kuty and Kosiv were the places we went to. The war in eastern Ukraine has also impact even there where it does not take place. Eight volunteers had signed up for the work-camp of SVIT Ukraine in the Jewish cemetery of Chernivtsi (Czernowitz), five did come. Many people are afraid to go to Ukraine. That there were gunfights in western Ukraine between police and the Right Sector – a right wing nationalist movement – shortly before the beginning of the work-camp, has not helped to defuse the situation. The summer camp of Action Reconciliation is less affected by this problem. There is a core group of volunteers who has been active for years in Czernowitz and can assess the situation realistically. To SVIT Ukraine every year new volunteers apply to join the work-camp. Many of thoose who think about applying know Ukraine only from the television news. The more grateful you have to be for those who came. There are the Ukrainian work-camp leaders Lesia and Lisa, Manon from France, Carola from Germany and Jukka from Finland. In a short time they have cleared a large piece in the Jewish cemetery of Czernowitz of undergrowth, trees and bushes. But the work-camp is not just about work, there is also an educational part. Last Friday – my last day in Czernowitz – I’ve been traveling with Arthur and the volunteers. Vashkivtsi, Vyzhnytsia (Wischnitz), Kuty and Kosiv were the places to go. The previous evening we had seen the documentary “A Shtetl in the Caribbean” at the movies – once the Temple Synagogue – in which the Jewish cemetery of Vashkivtsi briefly appeared. During our first stop in Vashkivtsi we could build on what we saw in the documentary. In all three other locations – Wischnitz, Kuty and Kosiv – there have been significant Jewish communities and Hasidic courts. The most telling places are the Jewish cemeteries with its beautiful stone carvings. As Vyzhnytsia in Bukovina was part of the Romanian occupation zone in WW2, there are also a few graves from the post-war period, proving that there were survivors, there is no such thing in Kuty and Kosiv. They are part of Galicia and were therefore part of the German occupation zone. Here the destruction is total. In the afternoon we returned to Czernowitz and met again in the evening for a last get-together – an opportunity to talk about what we have seen and to process it. For Arthur and me, it was also the moment to thank the volunteers for their commitment. With some of the volunteers of the past years I’ve become sustainably good friends and I hope that this will also be the case with the volunteers of this year in the future. 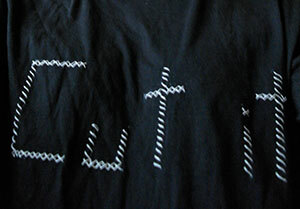 In parting, there was surprisingly a touching gift for me – a self embroidered t-shirt with the slogan of the workcamp: CUT IT! Thank you so much for that! I wish you all good luck and hope to meet you again, Lesia, Lisa, Manon, Carola and Jukka! And yes, cut it! This entry was tagged Jewish Cemetery, Kosiv (Kossow Kosów), Kuty, Vashkivtsi, Voluntary Service, Vyzhnytsia (Vizhnitz). Bookmark the permalink. you should visit Campulung Modovenesc, also.it has a beautiful synagogue – ( last wedding was celebrated in 1987) – and very old cemetery.